Home / UncategorizedKitchen trends for 2018!! Today, the kitchen is the focal point of the home, the place that brings everyone together at the start of the day or after a long day way. Kitchens have changed a lot over the decades. Technology advances and changing social dynamics have contributed greatly to the rise of the modern kitchen. There is a far bigger focus on open concept homes that revolve around the kitchen so everyone can be together. As with any modern design trend, clean and simple styles have become favorites for homeowners with natural light becoming an essential aspect of the overall look and function of the kitchen space. Here are the top trends in kitchen design we expect to see in 2018. Ease add-ons are motion sense-equipped kitchen faucets that can sense the presence of hands underneath and will come on automatically or try a one-touch feature. 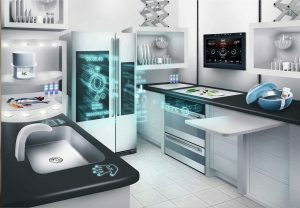 Refrigerators that can alert you when your groceries items are running low or a coffee maker programmed to have your coffee ready when you wake up. Do not forget to update your lighting system–allowing you to control all the lights from your Smartphone or tablet. While styles like farmhouse and mid-century modern are still popular, homeowners are getting more streamlined in their overall aesthetic, designs and alternative materials for kitchens. Stress-free environments are what you would like to come home too, and drown out the day to day stresses of life. Removing upper wall cabinets has become a growing trend in the last few years since it opens up the visual space making the kitchen appear much larger and brighter. It allows you to utilize the countertop space more productively. When we say streamlined, we don’t want to equate that with boring. So, consider materials with texture. If you are using open shelving, use rough cut wood to bring in natural elements or metal tubing for a more industrial look. Floor tiles in a natural stone or backsplash tiles that are sculpted or stacked make for the perfect focal point. These interesting textures are very different than the usual polished or glossy finishes we see everywhere. For high-end kitchen countertops, quartz still reigns supreme. 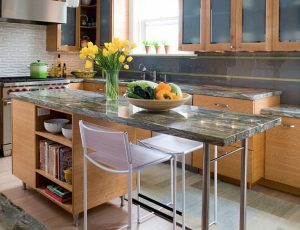 When quartz countertops first came into the market, the main worry was lack of variety in terms of colors and finishes. But with time, the manufacturers have provided a wide range of colors to choose from as well as realistic stone patterns. 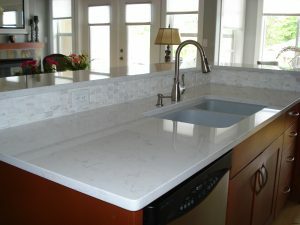 You can even get quartz finished with elaborate swirls and large veining to imitate other materials like natural stone. These unique styles have become immensely popular. Homeowners are starting to look for better storage solutions within the cabinetry. These can include: appliances garages for small appliance, drawer dividers for cutlery & utensils, pull-outs for spices, tray dividers, roll-out trays and caddies for pots & pans; as well as wastebasket cabinets for garbage and recyclables and/or deep drawers. These will make it easier to store foods, drinks and small appliances. Kitchen islands have become focal points and the hub of the kitchen since we are seeing less wall cabinet space in kitchen design. The kitchen island is meant to create an impact, and its design must make a statement. They will have storage solution cabinets and be fitted with various under-counter appliances while also providing seating–serving as a casual dining and/or drinking bar. To accommodate the increased size, we are seeing a tendency for the kitchen island to extend into living room spaces in homes with open plan designs. 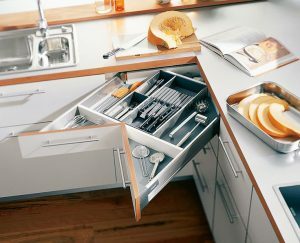 This ensures the kitchen island can be multi-functional without cluttering up space in the kitchen. Let these upcoming trends serve as design ideas for your new home. 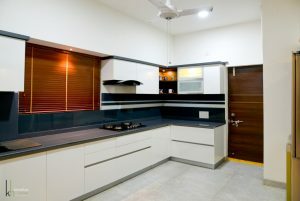 These ideas combine the best in functionality and aesthetics to create the ultimate kitchen. ← Choose the right Area Rugs! !